Export emails to a spreadsheet! Export Gmail messages to Google Sheets, Excel, or CSV with 1 click! 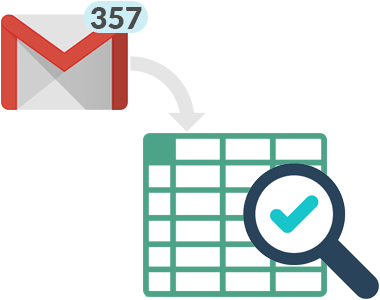 Export emails to Google Sheets, Excel, or CSV is fully integrated with your Gmail inbox. You do not have to download anything to your hard drive. Everything works directly within Gmail. Select emails in Gmail, click “Save selected conversations to MS Excel,” and your email and all attachments will automatically be exported to Excel. It’s as simple as that! Add additional data or merge data with information from other sources using pivot tables and other spreadsheet functions. The uses are limited only by your imagination! Export emails to Google Sheets, Excel, or CSV has almost universal 5-Star ratings from users who’ve downloaded it in Chrome. You can easily install Export emails to Google Sheets, Excel, or CSV from the Chrome Web Store. Once installed, the tool will be seamlessly integrated into your Gmail or G Suite email account. When and Who Can Use Export Emails to Google Sheets, Excel, or CSV? 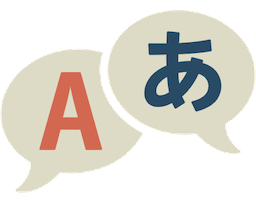 Gather and export emails, then send them to a translator for processing with a single document — a much cleaner process than forwarding dozens of emails individually. Make your data versatile! Extract and transform email information so it can be combined with business data from other sources in your company. How long does it take your business to fulfill an order? 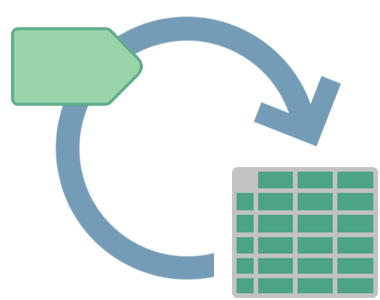 Find out by exporting and analyzing data from order and delivery emails. Are you responding to customers quickly enough? Don’t guess. Find out for sure by exporting your email history and analyzing the data from recent conversations. 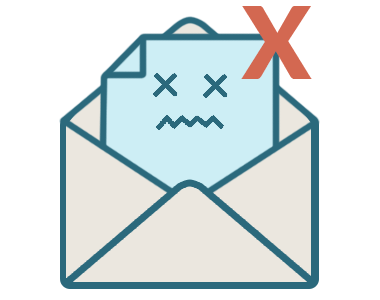 Sync bad emails to a spreadsheet using a Gmail label, then batch purge them from your system all at once — instead of processing them individually. Working on a lawsuit? Reviewing emails is a huge part of modern discovery for attorneys and HR professionals. Bosses and business owners also get pulled into this kind of investigation — trying to figure out what happened. Now you can grab all the emails you need and review them in one spreadsheet. 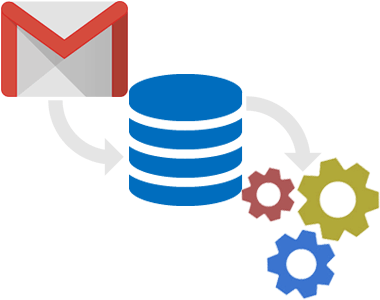 Import your email data into any other database by syncing a label to your Google spreadsheet. The sheet stays updated automatically! Export your email data and use it in any number of ways to improve your business. Export emails to create a mailing list. Keep track of orders and deliveries. 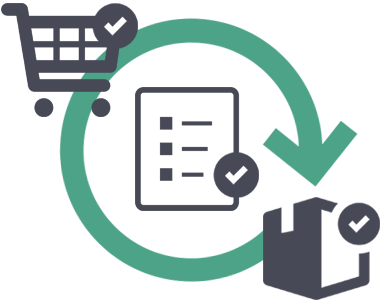 Analyze delivery and response times so you can improve them. 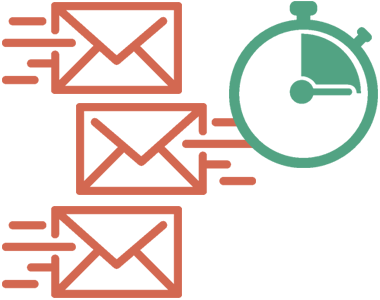 You can even combine email data with your customer database. Capture the email list from your latest webinar or trade show booth, then keep in touch with the list through your email marketing activities. For the discovery phase, export all emails related to a topic or from a specific email address. 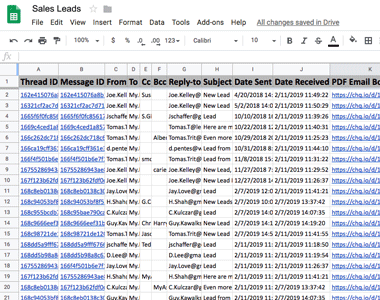 Review the full story of an event all in one spreadsheet — instead of flipping through dozens of individual emails within Gmail. *Bonus: When you buy an upgraded version of Export Emails to Google Sheets, Excel, or CSV, you’ll automatically get Save Emails to PDF for free so when you need to go to court, you can print the emails as 1 large PDF. You’re posting on multiple sites, and it’s hard to keep track of them all. Everytime you get a resume, have it auto populate into your spreadsheet, that way you can review candidates side-by-side to see which candidate has the best qualifications for the job.